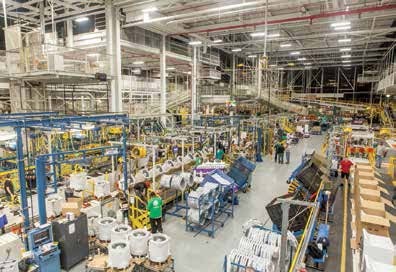 LOUISVILLE, Ky.—GE Appliances (GEA), a Haier company, and Jefferson County Public Schools (JCPS) announced two new programs that they say will be a national model for helping build the next generation of American manufacturers and strengthen the local partnership between one of Kentucky’s largest employers and the commonwealth’s largest school district. The first program of the GEA initiative will offer virtual classroom experiences for students in its Academies of Louisville manufacturing program at Doss High School. The second program, called GEA2DAY, will offer opportunities for high school seniors to join a new, weekly two-day workforce that provides a $14 an hour wage, real-world work experience, and up to $6,000 per year in college tuition. GEA Chief Operating Officer Melanie Cook and JCPS Superintendent Marty Pollio, Ph.D., made the announcement at Appliance Park as the company wrapped up four weeks of activities celebrating National Manufacturing Month. The new GEA2DAY program will create an additional 150 part-time jobs for Appliance Park. Students in the Doss High School manufacturing program will be able to take a virtual tour of GE Appliances in March of 2019 and have a live web chat with employees who currently work at GEA. Students will be able to ask employees about career opportunities, job responsibilities, and the education and experience students need to apply for these jobs in the future. As part of the virtual classroom initiative, GEA is also aligning the program with the JCPS Backpack of Success Skills initiative. Students will be given a real-world manufacturing problem to solve for GE Appliances.